Upon first read, I thought I was okay with Heroes in Crisis #1. Yes, it is heavy on atmosphere and light on story, but after Tom King's criminal misuse of Booster Gold in "The Gift", I decided that this was at least somewhat more respectful of my hero (even as it spits in the eye of the entire DC "Rebirth" initiative). But maybe I'm overreacting. Maybe I'm just overprotective of my favorite character. Call me Chicken Little. Am I alone? Let's find out. This week's poll question: What is your reaction to Heroes in Crisis #1? Please visit the Boosterrific Polls page to view results for this week's poll. Just read that synopsis and wow. Yeah. Nope. 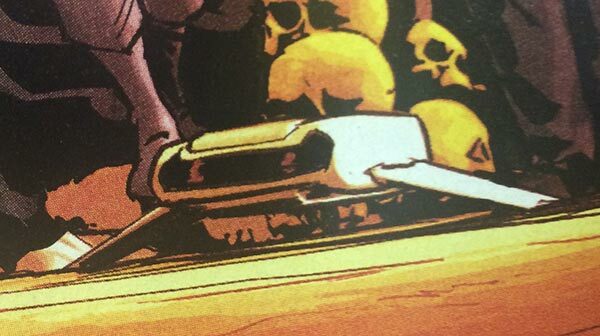 They killed a couple of Dc characters that not long ago were in a TV show constantly in one panel. Up to now it seems that being in a tv show is not a plot-armor in DC comics. Also, the way in which they dispose of those characters reminded me that Firestorm died in a similar fashion in Identity Crisis. That said, while the issue was ok, it reminds me too much of Identity Crisis and I fear not only for Booster but for this grim DC. 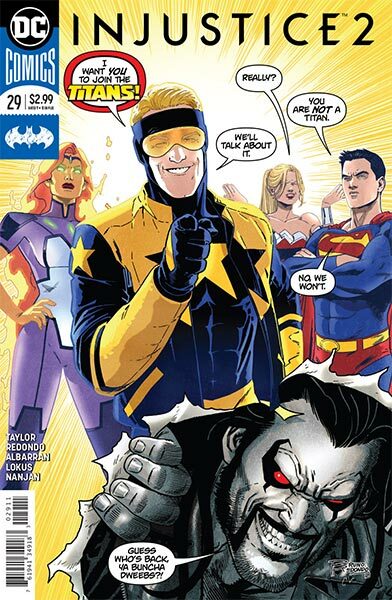 I thought the story itself was actually pretty good, however how not some confident that this story will use Booster Gold in the way we want... Nonetheless, it is nice to see Booster starring, just as long as things don’t go out of hand. My theory is that Sanctuary killed the heroes. Because of what ever problem that Booster had presented to it. And that Sanctuary is going to try and fix Booster but fail. Sorry it took me so long, i just finished my copy of Heroes in Crisis today. If Booster Gold gave six news interviews and then gave six more, how many interviews has he given in all? Newsarama.com has the November solicitations for DC Comics, and it looks like we'll be getting another rematch between two of DC's best heroes. Russ Burlingame writes about what this solicitation means for the "who will die" aspect of this series at ComicBook.com. (Warning: Link could be considered to contain spoilers.) Since Russ has that angle covered, I'm going to focus on what's really important here: the fight between the Man of Steel and the Booster of Gold. In Round One (Booster Gold #7, 1986), Superman (with a timely assist from Skeets) taught upstart Booster Gold a necessary lesson in how a hero acts. In Round Two (Action Comics Annual #4, 1992), Booster was outclassed by Superman, who was at the time in the thrall of Eclipso. In Round Three, (Booster Gold #8, 2008), Superman, this time controlled by Max Lord, ambushed and made short work of Booster and his makeshift team of Freedom Fighters. Of course, all of those previous fights were wiped from history by Flashpoint, so Heroes in Crisis #3 isn't technically a rematch. (As pointed out by @FAdamF on Twitter, much of what happened before Flashpoint is still part of most characters' history thanks to Rebirth. Therefore, these fights did *technically* happen, even if no one quite remembers it.) Given Booster's dismal record in this match-up, that might be a good thing. We'll find out if Booster can finally defeat the Metropolis Marvel this November. If Booster Gold had five costumes and Doomsday destroyed three of them, how many costumes remain? My television has been bombarded by Teen Titans Go! To the Movies ads for the past two weeks. I didn't pay them too much attention — I try to avoid movie trailers; I think they give too much away — but I could have sworn I kept spotting the Corporate Crusader in the background of some of the big group shots. Try as I might, I couldn't confirm that from the official trailers I found on YouTube. Booster Gold is clearly visible in this screen capture from the trailer compilation posted by Comicbook.com. You'll find this clip at 2:16 and repeated at 3:20. It's a Booster two-fer! Teen Titans Go! To the Movies is in theaters now, so I guess I'll be going to the movies this weekend. 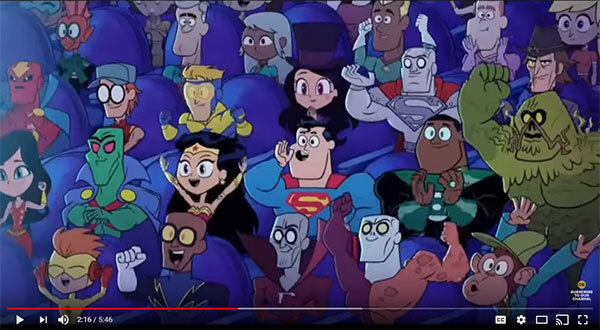 Booster and Beetle both show up in the movie a fair amount if your looking for them. Happy Independence Day! If you can tear yourself away from fireworks and hot dogs, get yourself to your Local Comic Shop today and get your hands on Injustice 2 #29, featuring Booster Gold's new jacket! Finally! A costume update that looks better than what he was already wearing! While you're there, consider picking up a copy of the suddenly very controversial Batman #50. Your LCS probably ordered too many of them. But I'm not advocating that you pick up Batman because I'm a nice guy who wants to see Local Comics Shops stay in business. No, like Booster Gold, I'm a little shallower than that. I'm suggesting you pick up an issue because Skeets is in it. What is Skeets doing here? I have no idea. It being a Tom King written book, I bet there's no logical reason, probably just an excuse to get Booster Gold fans to buy a copy. At least in my case, it will work. If Booster Gold gave five news interviews and then gave eight more, how many interviews has he given in all?